We have carved a niche amongst the most trusted names in this business, engaged in offering comprehensive range of Ice Cream Trolley..
We are successfully ranked amongst the top manufacturers and suppliers of Ice-cream Trolley that is widely used in retail outlets across the country. Our offered range is manufactured using quality raw material sourced from well established vendors of the market. 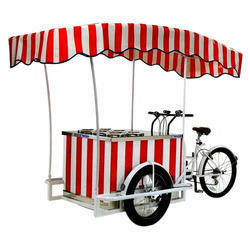 Our company is one of the emerging supplier of Ice Cream Tricycle. Keeping the diverse requirements of customers in mind, we are instrumental in providing Grinding Stone. We are successfully engaged in providing a wide gamut of Ice Cream Trolley. Being an eminent organization in the industry, we are involved in providing a premium quality range of Ice Cream Tricycle Three Wheeler. TRICYCLE CART constructed with tarpaulins and stailess stell outer body. And this cart fabricated with tricycle mode. we can attach bainmeries, hot storage or cold storage. Ice Cream Tricylcle/ Trolley with Size:38"